Unprecedented opportunities Arto Nurmikko, left, David Borton, and colleagues have developed a neural transmitter that can stream data from the brain to researchers while subjects sleep, wake, move about, and accomplish tasks. The transmitter can send data continuously for more than 48 hours on a single rechargeable AA battery. Neuroscience research has been constrained by the cables required to connect brain sensors to computers for analysis. In the journal <em>Neuron</em>, scientists in a collaboration led by Brown University describe a wireless brain-sensing system to acquire high-fidelity neural data during animal behavior experiments. PROVIDENCE, R.I. [Brown University] — In a study in the journal Neuron, scientists describe a new high data-rate, low-power wireless brain sensor. The technology is designed to enable neuroscience research that cannot be accomplished with current sensors that tether subjects with cabled connections. The head-mounted, 100-channel transmitter is only 5 centimeters in its largest dimension and weighs only 46.1 grams, but can transmit data up to 200 megabits a second. In the study the team demonstrated that the transmitter can run continuously for more than 48 hours on a single rechargeable AA battery as it relays a high rate of data directly from the brain. “The brain sensor is opening unprecedented opportunities for the development of neuroprosthetic treatments in natural and unconstrained environments,” said study co-author Grégoire Courtine, a professor at EPFL (École polytechnique fédérale de Lausanne), who collaborated with Nurmikko’s group on the research. Courtine and co-lead author David Borton helped to lead experiments testing whether the system could match the performance of the common wired systems. They, with colleagues at Brown and the Bordeaux Institute of Neuroscience, also applied it in two behavioral tasks to ensure that it relayed scientifically interesting neural patterns. The experiments employed a platform developed by the European Project NeuWalk, which is supported by a €9-million investment from European Union. In one experiment, three rhesus macaques took walks on a treadmill while the researchers used the wireless system to measure neural signals associated with the brain’s motion commands. Meanwhile they used other sensors to measure the activity of leg muscles. The data from the brain showed clear patterns of activity related to the movements of the muscles, demonstrating that the sensor allows for studies of how the brain controls the legs. “In this study, we were able to observe motor cortical dynamics during locomotion, yielding insight into how the brain computes output commands sent to the legs to control walking,” said Borton, now assistant professor of engineering at Brown. In another experiment, the Brown and EPFL researchers used the technology to observe brain signals for hours on end as the animal subjects went through sleep/wake cycles, unencumbered by cables or wires. Again the data showed distinct patterns related to the different stages of consciousness and the transitions between them. 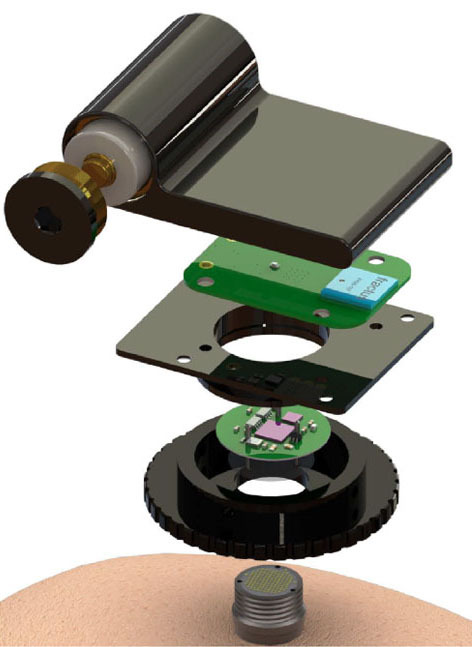 In 2013, Yin, Borton, and Nurmikko unveiled a related, implantable wireless brain sensor with a different design. Whereas the new head-mounted sensor is intended for research use by the wider brain science community, Nurmikko said, the researchers hope that wireless brain sensor technology will be useful in clinical research as well in the coming years. Blackrock Microsystems LLC of Utah, where Yin is now an engineer, has licensed a portion of the technology described in the new Neuron study from Brown University for commercial development. In addition to Yin, Borton, Nurmikko, and Courtine, the paper’s other authors are Jacob Komar, Naubahar Agha, and Yao Lu of Brown;Christopher Bull, professor of engineering, and Lawrence Larsen dean of engineering at Brown; David Rosler of Brown and the Providence Veterans Affairs Medical Center; Jean Laurens of EPFL; Hao Li of Marvell Semiconductor; Yiran Liang and Erwan Bezard of the Bordeaux Institute of Neuroscience; and Qin Li of Motac Neuroscience. Bezard and Li are also affiliated with the China Academy of Medical Sciences. The U.S. National Institutes of Health, the National Science Foundation, the Defense Advanced Research Projects Agency, and the EU funded the research.